Power(s) given Throw golden or silver exploding fireballs which turn enemies and blocks into coins. Gold Mario and Silver Luigi are forms debuting in New Super Mario Bros. 2, acquired by grabbing a Gold Flower. In this form, Mario can shoot gold fireballs and Luigi can shoot silver fireballs, defeating any enemy or breaking any Brick Blocks that is within a certain distance or any that they touch, turning them into coins. In addition, the blast will also empty out any blocks that contain items. 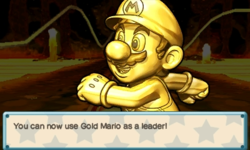 Occasionally, like other power-up forms, Gold Mario appears as a separate character from regular Mario. Gold Mario debuted as a power-up form in New Super Mario Bros. 2. In this form, the character becomes a glowing statue made of gold. In Luigi's case, he becomes a glowing statue made of silver. In both cases, the form resembles Mario's metal form since gold and silver are a type of metal. If Mario/Luigi reaches the Flagpole in this form, he receives a coin bonus. The higher the pole is grabbed, the more coins he will receive. Gold Mario/Silver Luigi reverts into Fire Mario/Luigi upon clearing a stage, making it impossible to keep this power-up between levels. Gold Mario is able to defeat almost every enemy in the game, including Boos, Thwomps, and even Spiked Balls (though not the giant ones), rivaling the power of Hammer Mario. He can also defeat bosses with one hit (though the Koopalings take three hits to be defeated). The power-up, however, has no effect against the Boohemoth. Gold Mario and Silver Luigi can also gain coins by defeating consecutive enemies, either by stomping on them without touching the ground, hitting multiple enemies with a shell, or staying under the effect of an Invincibility Star. The values gained consecutively are 5, 10, 15, 20, and 50 coins. When the area is under the influence of a Gold Ring, these values double to 10, 20, 30, 40, and 100 coins. The same values apply if a single blast from the Gold Flower defeats multiple enemies at once. One of the Mystery Mushroom costumes the player can obtain by chance after winning the 100 Mario Challenge in Super Mario Maker is that of Gold Mario (referred to as "Mario (Gold)"). This costume can likewise be unlocked if the Mario - Gold Edition amiibo is scanned upon the Wii U's GamePad. The costume consists of the original sprite of Mario from Super Mario Bros., only gilded. While acquiring this costume, the transformation sound effect from New Super Mario Bros. 2 can be heard. Sparkling sounds can also be heard at the time of wearing the costume. Gold Mario's blunt position, seen if the player presses on the controller, is that of him raising his hand while looking at the player. All of these traits are shared with the Silver Mario costume, which can be unlocked either by completing the 100 Mario Challenge, or by scanning its respective amiibo on the GamePad. Collecting a Super Star while this costume is active plays the Metal Mario theme from Super Mario 64 rather than the normal invincibility theme; this is also shared with the Silver Mario costume. A Gold Mario, Peach and Bowser statue is available in Super Mario Run as a My Nintendo or Remix 10 reward. The pose is identical to the regular statues but with a solid gold finish. Gold statues of Luigi, Daisy, Yoshi and Toadette were added in version 3.0.4 of the game, and can only be obtained in Remix 10. Gold Mario returns as a costume for Mario in Super Mario Odyssey. It can be unlocked immediately using either the Gold or Silver Edition Mario amiibo figures, or if the player obtains more than 480 Power Moons. Unlike previous games, Gold Mario has a different finish and reflection color to the gold coins in the Mario franchise. Mario's voice clips do not change when wearing the costume. Gold Mario appears as a separate downloadable character in Mario Golf: World Tour. He has the same stats, voice, and animations as the actual Mario with the only different one being his Double Bogey animation, where he turns into Super Mario instead of Small Mario. He has a permanent Gold Flower shot, meaning he collects a coin for every yard the ball travels. This means he cannot use special shot types (Power, Item, or Approach) and is not allowed in Coin-Collecting Tournaments or challenges. In Mario Open online tournaments, players are not allowed to use him. The computer never uses this character in match play. To obtain Gold Mario, all three downloadable packs, the Mushroom, Flower, and Star, must be bought. His costume is unlocked by getting 10 trophies in online tournaments. On the Golden Plains stage in Super Smash Bros. for Nintendo 3DS and Super Smash Bros. Ultimate, if a character collects 100 of the coins scattered across the stage, they turn gold temporarily. While in this form, the character's attack power is increased, and the character does not flinch and cannot be launched. Despite this, the character can still be launched by being grabbed and thrown. While in the form, the character cannot collect additional coins until the form wears off. Unlike New Super Mario Bros. 2, Luigi does not turn silver when he attains this form. In Super Smash Bros. Ultimate, some fighters can appear in their golden forms during spirit battles. In addition, Gold Mario appears as a Legend-class support spirit, using artwork from New Super Mario Bros. 2. When equipped, the fighter gains a permanent "Super Armor" which makes them harder to flinch or throw. The spirit can be summoned using a Metal Mario, Super Mushroom, and Fire Flower core. In Mario Kart Arcade GP DX, Gold Mario appears as a downloadable alternate color scheme for Metal Mario. Gold Mario appears in Mario Kart 8 Deluxe as a playable character and the game's sole unlockable character. He acts as a variant for Metal Mario, similar to the Shy Guy, Yoshi, and Inkling colors. He is unlocked by winning all twelve gold cups in 200cc. However, COM players never play as Gold Mario. Unlike previous appearances, Gold Mario lacks pupils in his eyes. His kart symbol is the same as Metal Mario's but with a golden M. He is also the 200cc staff ghost for Mario Kart Stadium. In Mario Tennis: Ultra Smash, it is possible to have Gold Mario as an amiibo doubles partner if the player uses a Mario - Gold Edition amiibo. Gold Mario himself is otherwise not a playable character. In Mario & Sonic at the Rio 2016 Olympic Games, Gold Mario appears as a Mii Wear costume. This can be obtained by using any Mario amiibo (except the Mario Sports Superstars amiibo cards). On 3DS, players can activate the Gold Mario costume for a limited time, whilst it can be unlocked permanently on Wii U if players complete the Mario amiibo league. Gold Mario's stats are overall better than all the characters in the 3DS game with the exception of Super Sonic, whilst in the Wii U version, it has balanced stats. Gold Mario appears in Puzzle & Dragons: Super Mario Bros. Edition as a Leader, available with the game's digital update to version 2.0, unlocked after earning an S rank or higher in Course 4 of the Fixed Challenge mode in Score Attack. Gold Mario is a Light/Light attribute teammate with an HP rating of 4/6, an ATK rating of 3/6 and RCV rating of 5/6. Gold Mario's Skill, Gold Shine, changes Wood Orbs on the Orb field into Light Orbs, while his Leader Skill, Gold Sunshine, raises the ATK of the entire team by 3x if the player clears two Light combos, or by 4x for three Gold combos or more. Gold Mario uses Fruit and Rare Fruit to raise his Skill Levels. Gold Luigi appears as a Leader as well, unlocked after earning an S rank or higher in Course 4 of the Free Challenge mode in Score Attack. Gold Luigi is a Light/Light attribute teammate with an HP rating of 5/6, an ATK rating of 3/6 and RCV rating of 3/6. Gold Luigi's Skill, Gold Flash, changes Water Orbs on the Orb field into Light Orbs. Gold Luigi shares the same Leader Skill and Skill item requirements as Gold Mario. In Super Mario Party, the characters turn gold when the player uses a Golden Drink. Then, the player will receive one coin for each space they move during the turn. For this subject's image gallery, see Gallery:Gold Mario. In the first Animal Crossing game, there are two furniture items based off of Mario and Luigi, the Mario Statue and the Luigi Statue. The Mario Statue is actually golden, and the Luigi Statue is silver. The model for the gold/silver fireballs always spins clockwise, even when thrown to the left. Gold Mario's artwork for Mario Golf: World Tour is an altered version of Metal Mario's from Mario Kart 7, replacing the tires he is leaning on with a golf club and giving him visible pupils. There are different amiibo versions for Mario, where the Mario amiibo is coated either gold-colored or silver-colored paint. These versions are called Gold Edition and Silver Edition, and may be referencing the power-up. In Hey! Pikmin, the Gold Mario amiibo, along with the Silver Mario amiibo and regular Mario amiibo itself, appear as treasures. In Super Mario Odyssey, wearing the Gold Cap and Gold Outfit when confronting Bowser for the final boss battle scares him. This is a reference to the fact that this form's fireballs can defeat him in one hit. ↑ Nintendo eShop description for New Super Mario Bros. 2. This page was last edited on March 4, 2019, at 21:19.